One term that doesn't get quite the mileage as it did in the days of desktop PCs is "ergonomic". The term is defined as being an adjective that means "relating to or designed for efficiency and comfort in the working environment", and ergonomic design of computer workspaces and surfaces can make a huge difference in the day-to-day comfort and health of computer users. Twelve South has just released the $49.99 Curve for MacBook, a stand that places the screen of modern MacBooks at the precise height for comfortable viewing. Back in 2003, Twelve South co-founder and creative director Andrew Green was working for Griffin Technology when it occurred to him that he needed some way to match the screen height of a Titanium Powerbook with an original Apple Cinema Display. He invented the iCurve for Griffin, which was an immediate hit for the accessory manufacturer. Fast-forward to 2017, with Andrew realizing that he could improve on the original design and create a new stand that would once again provide the functionality of the original iCurve yet match Apple's current design theme and color palette. 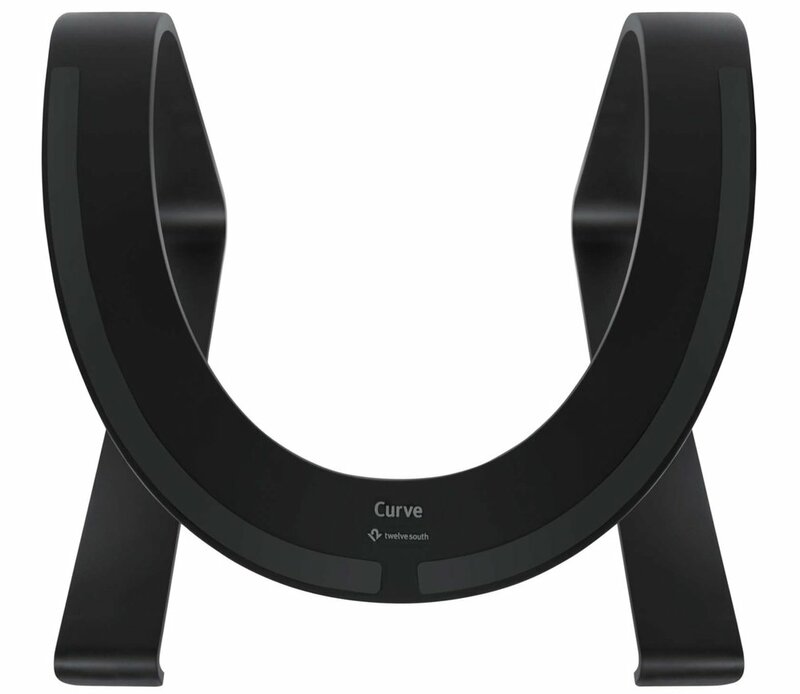 While the original iCurve was made of clear Lucite, the new Curve is a single curving strip of aluminum with a matte black finish. The Curve isn't made to prop up a MacBook so you can type on the keyboard; rather, you'll use an accessory keyboard and trackpad/mouse with the MacBook on the stand. Rather than looking down at the screen of the MacBook, the display is now elevated to the point that your spine is perpendicular to the floor -- a very comfortable and posture-correct way of looking at the screen. The Curve comes in a box with a fabric sleeve covering the metal, protecting it from scratches in shipping. Once the sleeve is removed, it's easy to notice the thin silicone strip along the curved bottom to keep the stand from moving on whatever surface it's placed on. In addition, two silicone pads on the supporting arms protect your MacBook from being scratched. Unlike some laptop stands I've reviewed in the past, the Curve is extremely stable and doesn't vibrate when the user is vigorously typing on a nearby keyboard. The screen height of my 13-inch MacBook Pro with Touch Bar was perfect when it was sitting on the Curve. I'm using it with a Logitech K850 keyboard and M720 mouse for a very comfortable working situation. Even with the MacBook Pro off of the Curve, the stand still looks good -- almost like a piece of sculpture. I found that the space between the base and the supporting arms is perfect for holding the keyboard out of the way when it's not in use. If you're interested in buying a Curve for your MacBook, there's no better time to do it. Use the promo code HelpHouston2017 when purchasing the Curve and Twelve South not only takes 12 percent off of the product price -- that makes it $43.99 -- but they'll donate 12 percent to the American Red Cross to support relief efforts in Houston and other areas devastated by the Hurricane Harvey flooding.